In the previous article, the first numeral code for an IP rating is mentioned as the protection level of a product against intrusion of foreign object, with IP5KX and IP6KX being the highest level. This article serves to elaborate on the latter requirements and how they differ from each other. 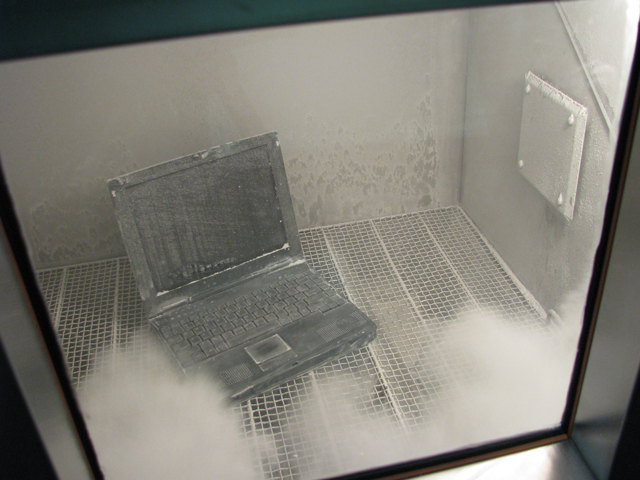 Dust test performed on a laptop within the dust chamber (photo taken from Espec website). Both protection levels are tested in the same way, except for one difference: the use of underpressure, or vacuum pressure as some has come to call it. In order to test a product's reliability under IP5KX or IP6KX conditions, it is required to be placed within a test chamber, usually known simply as a dust chamber, continuously for a certain period with circulating talcum powder. It is usual to encounter the term 'talcum powder in suspense' in the place to describe the circulating powder. Category 1 enclosures are products in which its normal working cycle involved the possibility of reduction in air pressure within its internal volume to a pressure lower than its surrounding. The product must be tested with vacuum pressure by maintaining its internal air pressure lower than atmospheric pressure through the use of a vacuum line. Category 2 enclosures are products in which no pressure difference relative to its surrounding air pressure is present. The product need not undergo vacuum pressure for this category. IP6KX requires that the product meets Category 1. It passes the test if no powder is observed within the internal volume of the product. It often falls to the designers to define the confines of the product. IP5KX can be conducted as Category 1 or 2. It passes the test if powder is not accumulated in a quantity or location such that the correct operation of product is interfered or safety is impaired. Note here that powder can exist within as opposed to nonexistence in IP6KX. A vacuum line will be required to extract air out from the internal volume of the product if a Category 1 test is to be performed. So why the difference, and how does an engineer judge which category should a product be tested for? The answer lies in the expected working cycle of the product in its environment. A product may be subjected to heating from a nearby heater, which introduced thermal cycling to its internal air volume. This cycling will create a pressure difference across the confinement of a product, hence a Category 1 test is required. Certain products are designed to allow airflow through the confinements of the product for cooling purposes. Grills and meshes may be incorporated to limit intrusion of foreign objects but air is otherwise free to flow, hence a Category 2 test will suffice. As one of the more severe scenario, a product could be used within a potentially explosive atmosphere, such as a mining site. Metallic particles may enter the product and drop onto circuit boards, thus creating sparks during short-circuits and igniting the fuel-saturated air. This calls for a Category 1, as well as IP6KX, requirement (the interested reader in this scenario should refer to the ATEX directive for further information). 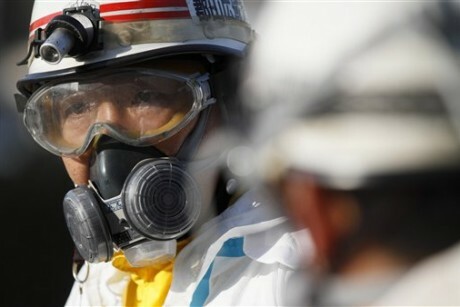 Protective equipment is as essential as this official scanning for radiation in the post-Fukushima disaster, for one who is in close contact with dust tests (picture taken from Salon website). The test sample is usually hung up or at least placed on a coarse mesh grid to assure that all surfaces are bombarded by the circulating powder evenly. The talcum powder in use is not your everyday talcum - this is a specially sized grain which needs to be sifted through a calibrated sieve to obtain the proper size. Of note though is that this powder is harmful to a person's eyes and respiratory system as it is very fine, hence proper personnel protection equipment should be donned and training should be conducted to any engineers or technicians working, or even in close contact, with such tests. The test duration depends on the test that is performed, and could be either 8 hours or 80 volumes of air exchanged. If the latter is used, then the test duration should not last less than 2 hours. The reason for 2 different test duration definition is due to the product's design and its characteristics during vacuum extraction of its internal air volume. Leaky seal may be part of the design intent of a product. When there is a pressure difference, pressure will not buildup since airflow will be generated. In this case, the air exchange test duration should be used. The complex geometry of a product could be simplified into a cuboid or several cuboids for calculation of air volume exchange, and should be simplified towards the worst case (the longer test duration is better than the shorter). Tight seal will cause little or no airflow generation, hence the negative pressure build. Since no air exchange is going to happen, the product will be tested for 8 hours.